The crest of the crook has a series of animals apparently biting each other, but the most evocative aspect of the decoration is the snake-like animals in figure-of-eight patterns that decorate the sides. They are in a similar Ringerike-type style to that used for the wooden crook. Moreover, excavations at High Street in Dublin have unearthed bone trial pieces in which similar patterns have been practised by craftsmen. The likelihood is, therefore, that this crozier, a sacred Irish object dedicated to an ancient saint, was made in Dublin. If this seems surprising, it is only because of the power of the story created by his followers of Brian as the hammer of the Vikings, who freed Ireland from a terrible curse. Brian attempted to create a unitary kingdom, calling himself imperator Scottorum, emperor of the Irish. The Battle of Clontarf, in April 1014, was cast in later Irish history as the successful culmination of his attempts to expel the hated Viking invader forever. It was, in fact, an example of how Irish and Viking politics had become intertwined: about half of the troops fighting for Sitric Silkenbeard, the Dublin king, were Leinster allies; Sitric himself was Brian’s stepson and son-in-law, and was half-Irish; and far from wanting to extirpate Viking influence, Brian’s ambition was to incorporate the bustling towns of Limerick, Waterford and Dublin into his ‘empire’. He had already taken Dublin once, on 1 January 1000, returning it to Viking control when Sitric submitted as his vassal. Dublin thrived under this arrangement, until Sitric joined a wider Irish revolt against Brian. Nor was the Clontarf battle itself decisive: Brian’s forces did not manage to enter Dublin. Sitric (unlike Brian) survived and ruled Dublin until 1036. This is not to say that Clontarf was other than a highly significant event, one that was recalled for centuries throughout northern Europe; essentially it was a struggle for control of the lucrative Irish Sea trading network, with the powerful Orkney lord Sigurd the Stout taking the opportunity to muscle in on Dublin by supporting Sitric. Ironically, the real effect of the battle was to prevent a non-Irish Viking takeover of Dublin. The way was open for Dublin to be more fully integrated into the rest of Ireland. 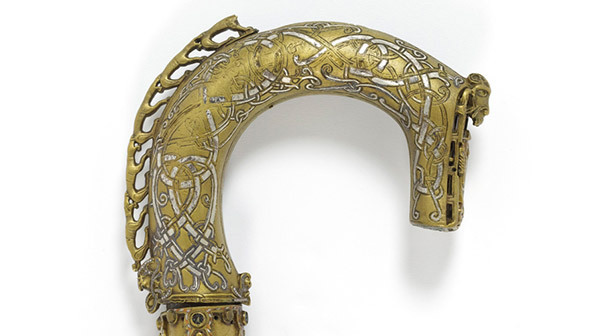 This crozier, probably made in the town after the Battle of Clontarf, embodies the way the force that once terrified the monks had become part of the Irish world.